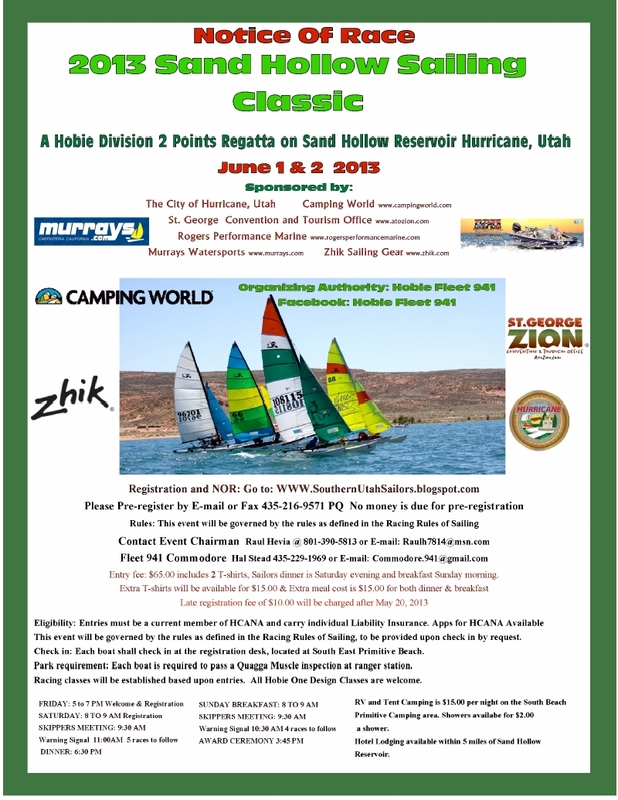 HURRICANE – The Sand Hollow Yacht Club and Hobie Fleet 941 are proud to announce the 2013 Sand Hollow Sailing Classic on June 1 and 2 at the Sand Hollow Reservoir in Hurricane. The regatta is sanctioned by the Hobie Class Association of North America and the regional Division 2 of southern California, southern Nevada, Arizona and Southern Utah. A minimum of 25 boats and at least 50 sailors from throughout the region are expected. A concurrent paddleboarding event will be held June 1 that is expected to attract 60 to 80 paddleboarders from across the Southwest. 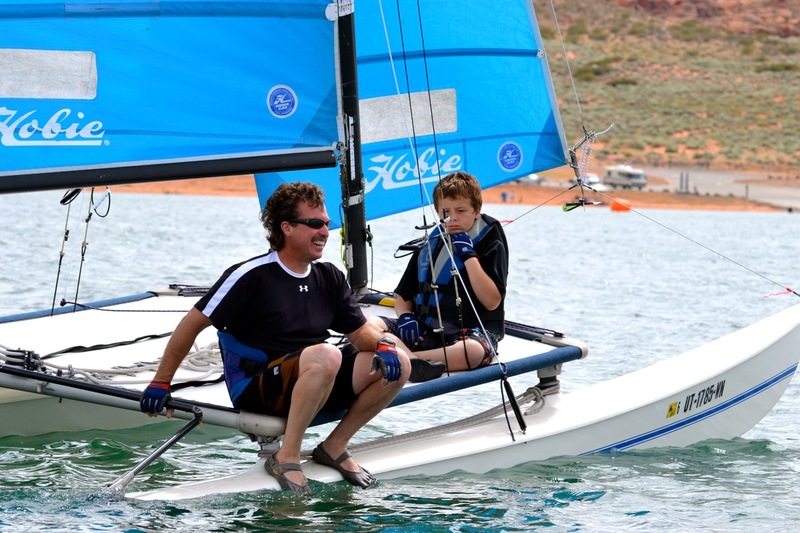 “This is the first time Southern Utah hosts an event that attracts national champions and sailors from the southwest region,” event chairman Raul Hevía said. The event kicks off at 8 a.m. both days. Multiple races will be held, depending on the classes of vessels that register. More information, including registration and safety requirements, can be found on the Sand Hollow Yacht Club website. I was gung-ho to go…until I saw the $75 admission price. Really? The entry fee is only $65. Could this be a typo? Admission after May 20 is considered “late registration” and costs $75, rather than the original registration fee of $65. See the event flyer for more details. Additionally, there is no spectator fee. Spectators are not charged any fees, but, the park entrance fee and charged by the park rangers at the Ranger Station Entrance of the Park. The registration fee is for the boats participating in the race. Paddle in the morning, sail in the afternoon! This Lake is a JOKE!!!! People pay for an annual pass and then when it comes time to use the lake it’s closed because some stupid event! Dewey, we were surprised by your comment as both the event and the park are open to the public. We called Sand Hollow State Park at 7:30 a.m. today and confirmed Sand Hollow State Park is open to the public as usual. It opened at 6 a.m.
We hope that helps. If your experience is otherwise, feel free to give me a call – 435-632-0825 and I’ll see if I can help you. Wow what an event! Another reason I want to move here. Thanks for sharing this, looks like a blast!